I’d read about Libretto Pizza a few months ago, touting authentic Neapolitan pizza certified by the Verace Pizza Napoletana Association, and is well known in pizza aficionado circles even outside of Toronto. 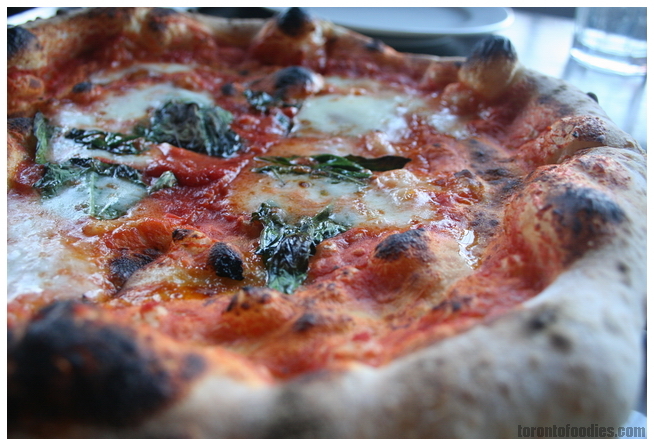 Queen Margherita has since come along, and is turning heads, making the list of Toronto Life’s top 10 new restaurants for 2010. 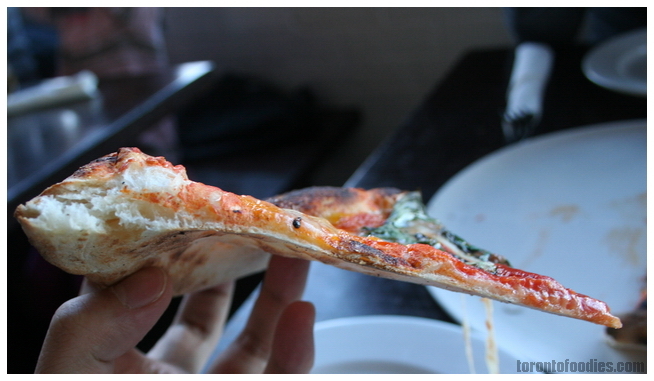 I’ve heard the QMP is also VPNA-certified, and so I plan to take my own shot at a comparison, knowing very little preconceptions about true neapolitan pizzas. 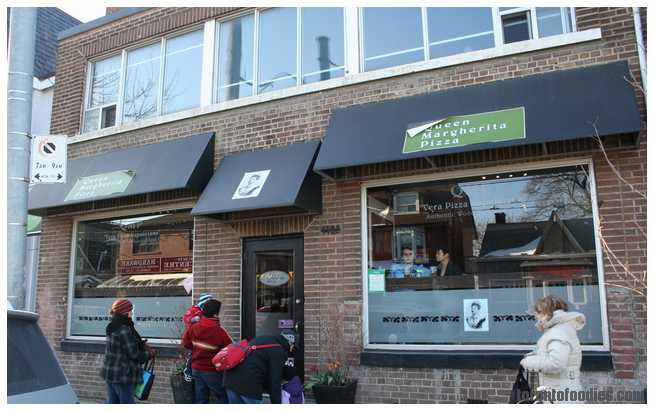 QMP is located right across the a TTC streetcar depot, and there is plenty of meter parking available on the street. 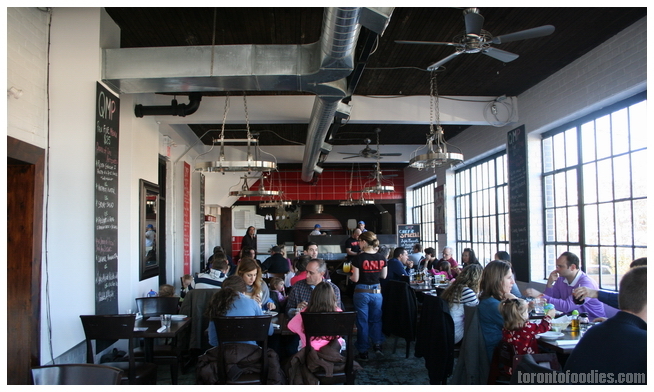 There’s both downstairs bar seating, as well as an upstairs dining area. Upon our arrival at 5:30pm, they informed us that they could only squeeze us in if we finished in an hour. The menu offers apps, a choice of 10~12 pizzas, desserts, along with a Prix-Fixe menu of any app, any pizza, and a dessert. The clientele ran the gamut from dressed-up dinner-dates to little-league post-game pizza to 2-adult-2.5-children families. 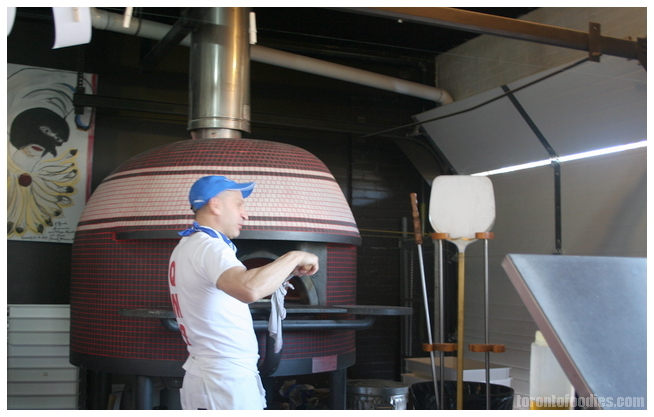 At the back, three chefs work the pizza oven. Overhearing the waiter at the next table, they mentioned the oven running at around 500F, with pizzas cooking for around 5 minutes. I may have misheard, as comparitively, Libretto runs at 900F at 90 seconds per pizza. There were roughly 6-7 pies cooking at the same time in the oven. We decided on the classic Margherita pizza ($13.95), with Fior di Latte (extra virgin cow’s milk mozzarella), tomato, and basil. The mozzarella was very light and mild, almost to a detriment. My dining mate commented that the flavours weren’t exactly like those in Italy, and would have prefered buffalo mozzarella for a stronger flavour to the cheese. The tomato tasted like real tomato, and not a pizza sauce, letting the natural ingredient shine through. For both the Fior di Latte and the basil, we felt that more liberal use of toppings would have made for a much better result. Of the four slices, some had no basil, and some only had a tiny bit of cheese. The crust is risen and fluffy, lightly charred for a toasty flavour, while the bottom is crispy yet soft with spotted charring. It’s definitely different from the usual uniformly-thin-curst pizzas and americanized dense-curst pizzas elsewhere around town. I’m excited about trying Libretto, then returning to QMP for another round. I definitely plan on returning to try some of the other pizzas, as this was very good pizza — if only they weren’t so stingy with the toppings.